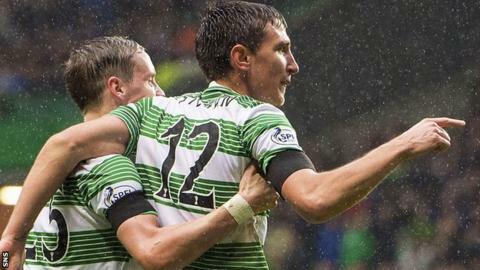 Stefan Scepovic at last feels an integral part of the Celtic set-up - thanks to his two goals in two games. The 24-year-old Serbia striker, a £2.3m summer signing from Sporting Gijon, broke his Celtic duck in Thursday's Europa League win over Astra Giurgiu. He followed it up in Sunday's Scottish Premiership win over Kilmarnock. "I always believed in myself and of course when you score goals it is more easier to get confidence and be in the group," said Scepovic. "Not just because of the goals but you get more confidence. "You just need to believe in yourself, train hard every session and be ready when you get the chance." "I feel very good. It is important as a striker to score goals, but the most important thing is that we won the games and we need to continue like this. "I said when I came that it would take time to adapt to the football here and the manager and everyone at the club has helped me. Against Kilmarnock, Celtic manager Ronny Deila paired Scepovic with Swedish striker John Guidetti in a two-man attack in an orthodox 4-4-2 system for the first time this season. The Norwegian was rewarded as both players scored in a victory that took Celtic above Kilmarnock into fourth place in the table. Ahead of Wednesday's Scottish League Cup quarter-final against Partick Thistle, Scepovic insists he will play in whatever role is required. "John is a good player and we did well in the game, but it is the manager's decision if we play with one striker or two," said the Serb. "It is also good to have good competition. "We are here to help each other, to work for the team and do what the manager asks from us." Scepovic agreed with Guidetti, the on-loan from Manchester City striker who has scored five goals in seven games and who suggested at the weekend that Celtic could lift all three domestic trophies this season - and win the Europa League. "It is possible, why not?" said Scepovic. "Everything is possible. "We are at a big club and we need to believe in our team-mates and everybody who works at the club. "But we have to think about the next game, which is tomorrow. "Every game is important and it will not be easy. We will need to be at it 100 per cent."